For a city with an arts scene that is truly coming into its own, Dallasites are spoiled for choice. Every weekend — and most weekdays — there’s an opening soiree, a closing party, a lecture or a special event tailored to the artistic community. It was a challenge to narrow down the 10 best contemporary art galleries for our Best of Everything series, but we chose established galleries that have helped solidify the city’s contemporary culture, as well as newer spaces by gallerists who draw the universal respect and support of their peers. Use this list as an entrée into all the Dallas art world can offer, and visit the Contemporary Art Dealers of Dallas for even more exhibitions, galleries, and tours. Texas’ oldest artist-run collective was originally founded by teacher Will Hipps and local painter Richard Childers to provide locals with an exhibition venue free of dealer restrictions. In its 35-year history, 500X has helped to nurture boldface names Frances Bagley, Nic Nicosia, Tom Orr, and Frank X. Tolbert, to name but a few. Rollicking exhibits by the 17 current board members are featured monthly in the upstairs gallery — at least until July when the 3,000-square-foot former tire factory and air-conditioning warehouse goes dark for two months due to lack of central cooling. 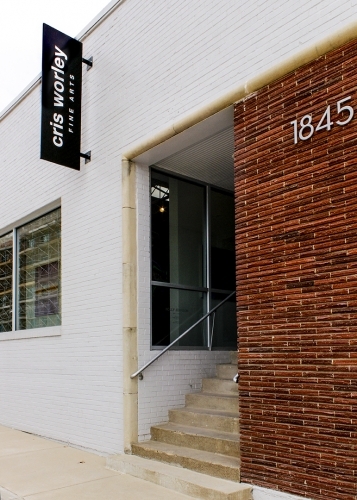 When ArtPlaceAmerica.org named Dallas one of the country’s top 12 “Top ArtPlaces,” earlier this year, Barry Whistler Gallery was on their must-see list. And no wonder: Whistler has been a Deep Ellum destination since 1985. The gallery doubled its size three years ago, giving it more room for photographs, drawings, paintings, and sculpture. As 90 percent of the artists, Whistler reps are now in the permanent collections of prominent state museums, this is one of the theplaces to score a piece by an established or emerging Texas talent. Under the aegis of director Heyd Fontenot, the University of Texas at Dallas Artists Residency’s nonprofit is a must-attend on the city’s art-opening circuit. Providing room for eight artists at a time to live, work and exhibit, CentralTrak balances its edgy shows with panel discussions and experimental music programs, and it is set to host the Texas Biennial’s performance art program this fall. The Design District might not have become the hot spot it is today if not for Conduit. Owner Nancy Whitenack presciently moved her gallery from Deep Ellum to the area 10 years ago, bringing along her blue-chip taste. With three spaces under one roof, she balances exhibitions of nationally recognized career artists with the work of promising young talent shown in Conduit’s project room. Amusing and thought-provoking installations round out the offerings, making this an engaging venue to visit for both the curious and the serious collector. Tall and striking, Cris Worley is a presence on the scene in and out of her Design District gallery. The former director of the internationally renowned PanAmerican Art Projects, Worley left to start her namesake space three years ago. She balances her representation of established Texan sculptors and painters with up-and-comers refined in local MFA programs, giving a talented new generation a fresh venue for their work. The enfant terrible of the Dallas art world, 24-year-old Kevin Rubén Jacobs spends his days as the assistant curator of the Goss-Michael Foundation and his nights and weekends running the 2-year-old Oliver Francis Gallery. Named after artists Oliver Rafferty and Francis Upritchard, Oliver Francis is the closest thing Dallas has to the in-your-face sensibility found in emerging galleries in New York’s Lower East Side or Berlin, with provocative work by artists from those two cities, as well as Chicago, Paris, Rio, Mexico City and Tel Aviv. If ARTFORUM, Art in America and the New York Times are paying attention to what Marty Walker is doing, you should too. Specializing in geometric abstraction and minimalism, she’s not afraid to throw some humor into the mix, as evidenced in exhibitions of work by Archie Scott Gobber and Wayne White (star of the recent documentary Beauty is Embarrassing). A charming, ivy-covered nook nestled across the street from Fair Park, the Reading Room was opened three years ago as a conceptual — rather than commercial — venue. Owner Karen Weiner characterizes it as “a place for things to happen that don’t happen elsewhere.” The Reading Room exhibits explore the way words and images interact through video, print, photography, installation — even embroidery. Art fans and literary lovers can align at the second annual Book Swap on May 11. Located in a former antique car storage facility, Talley Dunn’s light-filled environs are the perfect setting for works from the likes of Dale Chihuly, Ted Kincaid, Jasper Johns, and Erick Swenson. With more than 20 years of gallery experience in Dallas, Dunn curates two concurrent exhibitions onsite, as well as collaborating with museums, institutions, and galleries from coast to coast on special projects, installations and acquisitions. An oasis in the heart of North Dallas, the nearly 60-year-old Valley House is unlike any other art venue in Dallas — or anywhere else, for that matter. Its 4-acre garden makes a bucolic setting for Valley House’s sculptural offerings, but what’s going on inside the main gallery is just as interesting. Founded by painter Don Vogel, Valley House was taken over by his son, director Kevin Vogel, in the mid-1970s. Along with his wife, Cheryl, he curates an eclectic mix of contemporary work that has just two things in common: conception and craft of the highest level.